Another new feature is SVG effects for HTML, including masking, filtering and clipping. The point I made in the review is that this is a shot at Adobe as well as Microsoft. Although it is a long way from a viable alternative to Flash for now, the direction is clear. That does not mean it will succeed. On the other hand, if Apple, Google and Mozilla pull together in making browser standards rich enough not to need plug-ins for most of the scenarios where Flash is used today, this could disrupt Flash momentum. 1. Will Microsoft implement these standards or hold back, arguing that Silverlight makes them unnecessary? 2. Will IE retain its market dominance – still over 65% last time I looked, even though it is losing among developers and influencers? Although Canvas arguably competes with Adobe’s Flash plugin in a certain set of use cases, it’s worth noting that Adobe doesn’t generate revenue from the Flash plugin itself. Adobe cashes in on Flash by selling its powerful authoring tools, which the company could easily extend to support standards-based web technologies. It’s a fair point; but given the commercial advantages of owning the platform, as opposed to being just another tools vendor, I doubt Adobe would make this shift unless it saw no realistic alternative. Even fully open-sourcing the Flash runtime would be less risky. You can find Firefox here, and the developer features are described here. As a Flash developer I do wonder: what exactly *is* wrong with Flash? Is the fact that it’s a plug-in inherently evil? @Stefan Flash is fine though there’s an argument that <video> etc is better for integration with the rest of the page. Beyond that, it is political; Google, Apple etc don’t like a single company owning the platform. I can tell you from a Linux perspective what is evil about Flash. On this box I have Mandriva 2009 Spring 64bit installed. All was fine except it has 64bit Firefox which is not compatible with the eBay addon and I kept missing the end of auctions without it. I had also read, although I cannot verify if it is true, that 64bit Flash on Linux does not support graphics acceleration so runs in software mode, compared to 32bit which does support it. So, I uninstalled 64bit Firefox and tried to uninstall 64bit Flash. All seemed to go well except when I installed 32bit Firefox and 32bit Flash, Firefox did not seem to find it. Somehow, 64bit Flash is still installed and I have the hassle of trying to figure out how to get 32bit Flash to work for 32bit Firefox. Its probably as simple as copying it into my home directory instead of the global plugins folder, but its still a PITA. There are also other situation where plugins are not helpful. For example on my Windows Mobile phone Flash is really unstable and barely works. I am fairly sure that if a web browser comes out that supports similar functionality built-in using standards it will work a whole lot better. So, as usual, its all about compatibility and not having to worry that the right plugin is available for your browser – because the browser supports it natively. I totally plan to check out these new features for my websites as soon as I get 3.5 final installed. Proprietary plugins had a chance under the Wintel monoculture but their time’s up and the onslaught of all sorts of weird and wonderful internet access devices with a myriad processors (qualcomm, amd, mips, intel, etc. ), operating systems (linux, android, etc.) and browsers (firefox, fennec, webkit, safari, etc.) will soon make it virtually impossible for anything other than an open source implementation to gain more than even a 50% market share. Even then you’ll be wishing you were part of the browser to be able to reach serious penetration rates (turning away 1 in 100 customers may be tolerable but how about 1 in 10?). These guys are just DREAMING. HTML 5,6,7, it makes no difference. Their belief system is flawed, and leads to faulty conclusions. It’s not media elements or the Canvas that drives Silverlight especially, and Flash/Flex either. It’s a combination of things this stuff can’t match. An enterprise development environment, reusable code, and in the case of Silverlight, the ability to CHOOSE the language of your choice. Also in the case of Silverlight, the ability to develop modern applications that utilize modern language features, and THREADING!!! Superior applications for end users. Where did you get the 50% Flash penetration figure from? Most people who measure these things get results roughly similar to the riastats.com page. Of course this begs the question how many people will have support for the video tag or advanced canvas features by the end of this year? If someone is actually measuring how many people have a browser with full draft HTML 5 compliance it would be nice to see the numbers. Is Flash evil? No, I don’t think so. Is it frustrating for many Linux users? Yes! Does it have limitations because it is from a single vendor? Yes. Does it have advantages because it is from a single vendor. Yes. At any rate, I hope Microsoft steps up on HTML 5. But we’ll have to wait and see. Note that Adobe does already support a number of the major AJAX libraries in Dreamweaver, despite the fact that in some use cases, it competes with Flash. Dreamweaver also currently uses WebKit for the preview screen and Adobe AIR also uses WebKit for rendering. So I imagine with the next version of Dreamweaver they will support HTML5 tags such as the video tag, as to ignore it would put Dreamweaver at a disadvantage. “Apple refuses to implement Ogg Theora in Quicktime by default (as used by Safari), citing lack of hardware support and an uncertain patent landscape. Also currently the video tag has no security measures, meaning anyone can download the video file to their computer. Without that, we won’t see companies like Hulu, NetFlix and any other company that values it’s content switch over to HTML5 video tag any time soon. The video tag is also missing simple features such as full screen video and more complex features that Silverlight and Flash recently introduced such as variable bit-rates, so that video can keep can streaming even when user’s internet connection slows down. Adobe just introduced peer-to-peer video capabilities in Flash Player 10, which we are likely to see more of as the penetration numbers of Flash Player 10 go up (currently at 85% in the US/Canada). So both Adobe and Microsoft are not exactly standing still when it comes to video adding new features. Now browsers could attempt to incorporate similar features, but I doubt they would all see eye to eye on implementations when they cannot even agree on video codecs. Also Adobe can get over 90 percent of users to upgrade Flash in under a year, while there tends to be 5 year cycle before over 90 percent of users upgrade their browser. Meaning that video in the browser will likely always lag behind in any new features and even codecs. 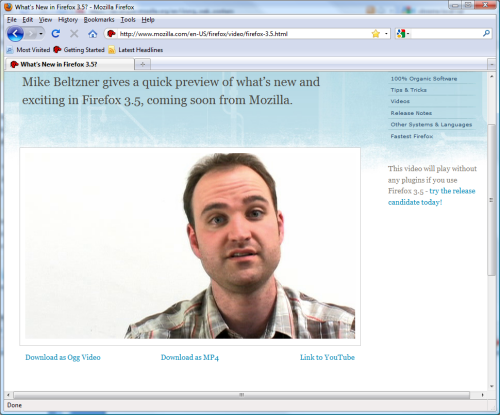 One interesting angle on the title of “Mozilla takes aim” ironically rests with the proposed VIDEO tag itself. Its weakness was “we’ll offer a solution!” without describing what that solution was, which is how the ludicrous codec situation came about. If there had been a little less anti-plugin rhetoric, and more emphasis on how technologies could cooperate together, then over the coming months Firefox would not be at risk from pages written for other vendors’ H.264 VIDEO. No action item on this — little can be done now, without major course-correction — but the irony may be useful to reflect upon. It’s true they don’t like it, but the reason is wrong. If you have no products that people are willing to shell out big bucks for, you attack the people that do. They’re jealous of Microsoft’s hard fought victory to win marketshare in office, dev tools, etc. IMO, that’ the evil, however, Microsoft has perpetrated plenty of evil on it’s own, so don’t think I’m defending them in general, just this specific subject. @Alex, if you were using 64-bit Flash on Linux, you made a decision to use an alpha version of a software package and you have to live with the consequences. If that stuffed up your 32-bit Flash, you can’t blame Adobe for this. The HTML5 video tag will never take off if Mozilla chooses not to/can’t afford to license H.264. Google, Apple, Adobe and even Microsoft in Silverlight 3 are supporting H.264 because the quality is superior to Theora. It would be ironic if it turns out that Mozilla become the biggest obstacle to the adoption of the Video tag that they have been championing for some time. However, when extensions in Chrome are fully implemented we might see Chrome crush Firefox anyway given the huge disparity in resources available to Google vs Mozilla Foundation (everyone knows Google provides the majority of Mozilla’s revenue anyway). Fallon, Google and Apple are quite profitable. They had 22 and 32 Billion US in revenue last year so they must be selling something to someone… At work I bought an iPod touch this year just so we could test some mobile apps on a real device. Consider things from Google’s point of view. Let’s say you are a developer working on Voice and Video Chat for Gmail. You know you can display H.264 video using Flash but you also know that Flash doesn’t encode in H.264 and doesn’t use a license-free peer-to-peer protocol for streaming between clients. So what do you do? If the Flash Player was open source, or if Adobe had a modular and open extension mechanism in the Flash Player, Google might have considered working to extend Flash. But it doesn’t. If you want a new feature you have to ask Adobe to implement it. And some features like Adobe’s new peer-to-peer protocol RTMFP will cost money to use. So, what did Google do? They wrote their own browser plugin to encode video and stream it. So you can understand why, when Tim asked Google’s Dion Almaer about Adobe Flash he said “it’s not open enough” for Google. So, I think it is political in the sense that the Flash platform is controlled by Adobe which makes it less useful as a platform for Google and some others. Of course mileage varies. For a small IT shop like the one I work in, Flash is very useful. Brian, I understand that they’re making money, but it’s the difference between making money, and having WEALTH. Microsoft owns the platform that all of them must rest upon, or at least the best platform( IMO), and everybody from IBM to Sun, to you name it, wishes they had that platform. Not to mention the Office franchise, these are things to be envied by ANY business man worth talking about. I’ve seen both sides, being a unix/java developer before moving to windows/C#, and falling in love with the Silverlight platform. Quite frankly, C# got better than Java, and Silverlight is better than Flex(without threading, I don’t consider it viable in the long term). Microsoft has done it again, embracing and extending to produce a better product, but this time, better technologically as well as ease of use. I both admire them and to a degree dislike them for some of the things they do, but I must admit that their behavior has been going in the right direction. Open Source is good for some things, but not all things. I do lean heavily on the operating system being open source, but would back off if it’s openly extensible. So let Google and others try to limit or destroy MS’s platform and tools, I think it’s great. Hopefully they will either come up with something better, or invent some useful things along the way. Either way, we should benefit, and also get some innovation out of MS as they struggle to maintain dominance. All I hear is the VIDEO tag. Do people realise that Flash delivers so much more than just video? It’s a point that Microsoft also often forgets when it argues for Silverlight. We’re building RIAs here, and more often than not they do not involve video at all. In fact, video based apps only make up a fraction of all Flash based apps. Perhaps this the blame should be put on distro creators. You see, I did not CHOOSE to run 64bit Firefox, it comes as standard with 64bit Mandriva. Now on Windows I will just install the 32bit version of Firefox and be done with it. On Linux, I had to try to remove the traces of 64bit Firefox or at least get it to look at the 32bit files instead. It is actually working now, magically fixed itself when I manually installed Firefox 3.5 32bit. But like you said, if 64bit FLASH is Alpha status then that is EXACTLY the argument for HTML 5. I shouldn’t be forced to have inferior support simply because I am using 64bit software and with the browser supporting things natively, that should no longer be an issue.